Of the four types of primary bone tumors, osteosarcoma, chondrosarcoma, fibrosarcoma and hemangiosarcoma, osteosarcoma is the most common type of bone cancer in greyhounds as well as other dogs. Large and very large dogs are 20 times more likely to be diagnosed with osteosarcoma than are smaller dogs. Osteosarcoma is responsible for more than 85 percent of bone tumors in the leg but can also occur in the spine, jaw, skull, pelvis and ribs. 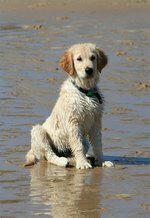 Osteosarcoma typically affects male dogs, younger dogs aged 1 to 2 and older dogs aged 7 to 9. Symptoms of bone cancer can vary from a limp or bone tenderness to a hard lump on the ribs or a sudden, unexplained bone fracture. Painful swelling can involve only the bone or can also include surrounding soft tissue. The dog may experience loss of appetite, depression or decrease in activity. If the dog has osteosarcoma of the skull, he may exhibit problems with chewing or swallowing, facial swelling or nasal discharge. A vet will typically diagnose bone cancer by X-rays of the affected area. A confirmatory bone biopsy is usually not recommended because of the significant risks of post-operative infection and pathological fractures. The vet will usually perform a chest X-ray to determine if the bone cancer has metastasized to the lungs. Diagnosis is frequently delayed because a dog's limp is often attributed to lameness, and pain can be masked with anti-inflammatory drugs. Early detection and treatment of bone cancer are important for extending the dog's life and improving the quality of life. Bone cancer in greyhounds is usually treated with a combination of amputation and chemotherapy with carboplatin or doxorubicin. A greyhound can expect to live for 4 to 6 months with amputation and no chemotherapy. With the addition of chemotherapy, the greyhound's life expectancy is about one year. Greyhounds treated with radiation therapy to the site of the bone cancer plus carboplatin chemotherapy have some relief from bone pain. The greyhound's life expectancy with this type of treatment is usually 3 to 4 months. If amputation is not an option because of the location of the cancer, euthanasia should be considered because bone cancer is extremely painful even with medication. Depending on the location of the bone cancer, bone sparing surgery has been successfully performed on greyhounds. The surgery uses a bone graft from a cadaver to replace the cancerous bone. Complications after surgery can lead to amputation of the leg. Life expectancy is similar to that for dogs treated with amputation and chemotherapy. Experimental treatment using suramin, a polysulfonated naphthylurea, in laboratory studies has been found to increase the potency of doxorubicin without increasing the toxicity.